Among the challenges homeowners face in the summer around here is an influx of mold, allergens, and other unwelcome contaminants. They can cause numerous problems, ranging from a general stale quality to the air to active illnesses being passed from one family member to another. Frequent rain and high humidity act as incubators for germs and contaminants of all varieties, and as hard as you work to keep them out of your home, you let more of them in every time you open your door. Luckily, there’s a solution to all of that. A UV air purifier installed in your HVAC system provides a potent weapon against germs, bacteria, and other biological contaminants in your home. It can be installed easily by professional technicians and, provided you replace the bulb periodically, it should provide many long years of reliable use. Here’s how it works. Winter means cold and flu season here in Westlake, OH, and to a certain extent, there’s nothing we can do about that. The conditions always make illnesses spread, and while you can take basic steps to cut down on the impact, sooner or later, your family is going to get hit with a nasty bug or two. The good news is that you don’t have to leave it at stocking up on chicken soup and bundling family members up against the cold. 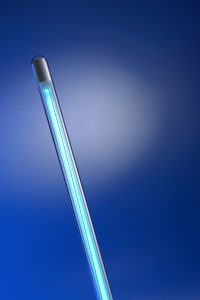 A UV germicidal light installed in your HVAC system makes a formidable weapon in the war against winter colds. Fairview Park, OH residents always keep an eye on their home temperature levels, and trust their HVAC system to keep them warm in the winter and cool in the summer. But you can use that system in other ways as well as with addition of indoor air quality devices. For example, take a look at UV germicidal lights, which can be placed in the apex of your heating and cooling system where the conditioned air is blown into your ducts. Such a system could make for a happier and healthier household. Here’s how. Posted in Indoor Air Quality | Comments Off on How do UV Germicidal Lights Work? How Do UV Germicidal Lights Help My Home? Posted in Indoor Air Quality | Comments Off on How Do UV Germicidal Lights Help My Home?